So, I've been noticing everyone doing this (It's Tuesday and I Can't Wait...) and I thought I'd join in. Thanks Lou! 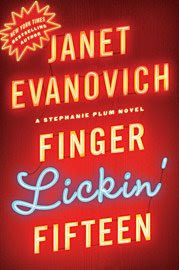 for the new Stephanie Plum novel Finger Lickin' Fifteen from Janet Evanovich! They nearly always have a pub date of my birthday (June 21) and this year the official pub date is the 23rd. I popped down to Target in my lunch break and they had their other big June new releases in but no Stephanie Plum! Am hoping they will get it in a few days early and I can treat myself to an early birthday pressie! Thanks for playing along on Tuesdays. When I worked in a bookshop we used to love when the new ones would come in. I haven't read any for a while I should get back to them. Very funny! I so love these books- i am up to 10 big ones and they are so much fun! I cant decide if i love Ranger or Morelli the most- it always changes!